You may have noticed swallows that have nested under the bridges on 11400 S. The Association has looked into these particular birds and they are federally protected species of bird and we are not able to tamper with the nests until after they migrate this fall. Once the birds have migrated we will go through the area and clean up their nests. It surprised me that they didn’t mention the BEST reason to have cliff swallows inhabiting Daybreak. Each swallow eats close to THREE pounds of mosquitoes every day. Rather than trying to get rid of the birds, we should be encouraging them to stay here because there is a lot of water for mosquitoes to breed on Oquirrh Lake. Cliff swallows might make unsightly nests under the bridge, but I’d much rather deal with that and bird droppings than to have to constantly fight swarms of mosquitoes with every walk around the lake. Almost a week ago, Mike and I took photos and some video of The Swallows of Daybreak. Here’s what we saw. There was some excitement in the neighborhood yesterday. Hundreds of cars were parked around the Oquirrh Mountain Temple and people were rushing to see the the replacement of the Angel Moroni on the top of the LDS temple. Nothing had been done to correct the damage done to the Angel Moroni statue. I kind of expected to see scaffolding and crews around the temple day and night as soon as the open house was over, but instead, they brought in a replacement Moroni and just switched them out. After two months, the charring from the lightning had faded, but there is no denying that the new statue looks much better. It was impressive to watch the process and see the crowds of people, eager to see the local church be repaired. Update 08-13-09: According to 2News, the new statue has TWO lightning rods in it now, one on the trumpet and one on Moroni’s head. Glad to know that they are planning for the future this time since South Jordan gets a lot of lightning and the Oquirrh Mountain Temple is the tallest thing for miles. Many thanks to About.com DIY Fashion Gallery for this Steampunk Hat. 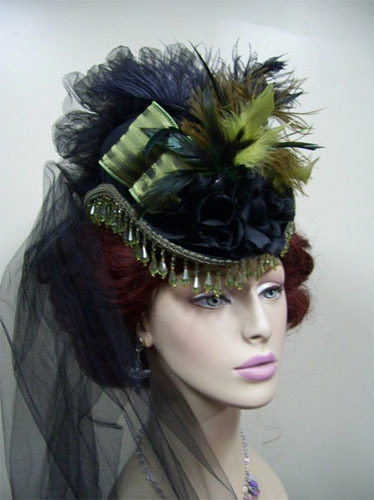 I found a derby hat at Thrift Town the other day and I had some ideas of how I was going to steampunk it up for Halloween, but this visual not only combines what I was thinking, but also adds a few feathers to the mix that I didn’t even imagine! Tune in tomorrow to see my totally awesome steampunk brass ray guns Mike and I made! There’s a tutorial if you want to do the same for the Halloween party! Today, Mike and I are celebrating our wedding anniversary. I was looking through old photographs a few months ago and came across this grocery store receipt in our wedding album. It was from the first time we went to the grocery store together. It made me smile to see it. I remember saving it because I thought it would be fun to see how different prices were, but the cost of things hasn’t changed all that much. Lynn Wilson Burritos are still three for a dollar. A small bottle of Tabasco sauce is still about a buck. What’s fun for me is to see WHAT we bought. That magazine at the top of the list? It was a Weekly World News. Mike and I used to get them EVERY week just to read about Bat Boy and Ed Anger’s weekly rants. I don’t know when we stopped getting the Weekly World News at the grocery store. It’s not like I consciously thought that I shouldn’t buy it. It’s just that we stopped buying it and reading it together. I heard that they weren’t going to print the Weekly World News anymore. Is that true? Are they still around today? I should really check the magazine racks next time I’m at the grocery store. It looks like we bought twelve Lynn Wilson Burritos. Mike and I survived on them when we were first married. In fact, our freezer is still stocked with them. I haven’t eaten one in months, but we ALWAYS have them. Mike will eat one or two and then the rest of them get covered with ice crystals. We’ll throw them away and buy twelve more. It’s like our eating habits have changed, but our BUYING habits haven’t. To go with the burritos, we bought a bottle of ketchup, a bottle of Pace salsa and a tub of sour cream. I had never eaten Lynn Wilson Burritos with ketchup. That was something that Mike introduced me to. I was a salsa girl, even back in 1990 before salsa was filled with cilantro and papayas. I had never eaten burritos with sour cream either, but it was an added bonus that made it feel like a treat. Now, our spice shelves rival any other food in the house. Not only do we have several shelves right above the stove, we have a cupboard shelf full of them. If I were to make a list, you would think I was joking. I’m kind of proud to see the Granny Smith apples on the list. I had no idea that my insane preference for those apples over all others happened when I was so young. I thought my apple phase happened much more recently, but it looks like I had that preference even back then. I used to drink Diet Shasta out of 2 liter bottles because it was cheaper than any other soda. Now, I can’t even imagine buying Shasta soda. Somehow the idea of drinking generic brand soda has been equated with being poor. Shasta doesn’t taste all that different than the brand names, but because I drank it when I was poor, I don’t want to buy it now that I have money. I don’t know why that correlation never happened with Ramen noodles or macaroni and cheese, however. Speaking of Ramen, I’m surprised that we didn’t buy any that first day of our marriage. 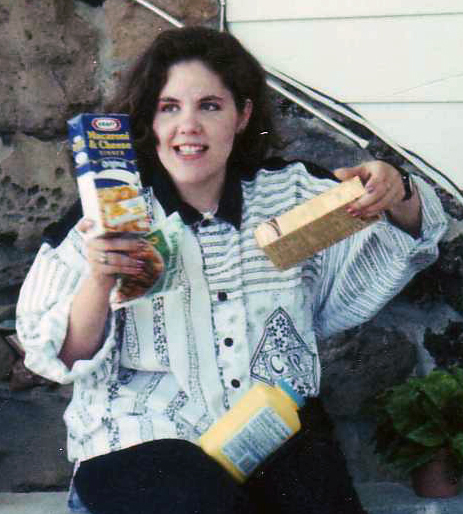 At my wedding shower, some people bought us kitchen staples, like baking soda, flour, etc. I think a flat of Ramen was one of our gifts. That’s the only explanation I have for not having any Ramen. I looked through the bridal shower photos and I did find this one of Kraft Macaroni and Cheese, but I didn’t see any Ramen. I’m sure there was some, we just didn’t get a photo of it. On a side note: God, I LOVED that shirt. I wish I still had it today. It was my FAVORITE shirt of the Eighties. Look closely and you can see that I’m wearing my St. Germaine Swatch. It matched that shirt perfectly. It may be why I loved that shirt so much. I know I have photos of Stacey wearing this shirt (borrowing my clothes when she wasn’t supposed to). I think this shirt represents the Eighties to me far more than any other piece of clothing I owned. Finally, when you look at the date on the receipt it’s dated 08-19-90. It was LITERALLY the day after we got married that we went to the grocery store. I remember it feeling so great to go to the grocery store with Mike. It was like we were a REAL married couple. Writing on the marriage license and having a wedding didn’t nail that idea home as much as going grocery shopping with him. Happy Anniversary, Mike! If I could do it all again, I wouldn’t change it for a minute.